Rising construction costs and less federal funding than anticipated also contribute to the financial problem. When voters approved a 9-year, $930 million transportation levy in 2015, it was advertised as a comprehensive approach to solving Seattle's growing traffic problem. Now, funding is falling short because of insufficient cost estimates in the original levy budget along with rising construction costs and limited federal grant opportunities. Gordon Padelford, the Executive Director of Seattle Neighborhood Greenways says he wants the city to deliver on the promises voters expected. "We are concerned about not fulfilling the projects outlined in the Seattle levy," said Padelford. The levy is supposed to focus on transportation issues like the expansion of bus lines, road and sidewalk repairs, and building bikeways. The funding shortfall was the focus of a Tuesday afternoon meeting at city hall. "Obviously, this is not a fun conversation to have," said Councilmember Mike O'Brien. "We need to get this under control. We need to understand what has happened." Staff from the Seattle Department of Transportation, including Interim Director Goran&nbsp;Sparrman. 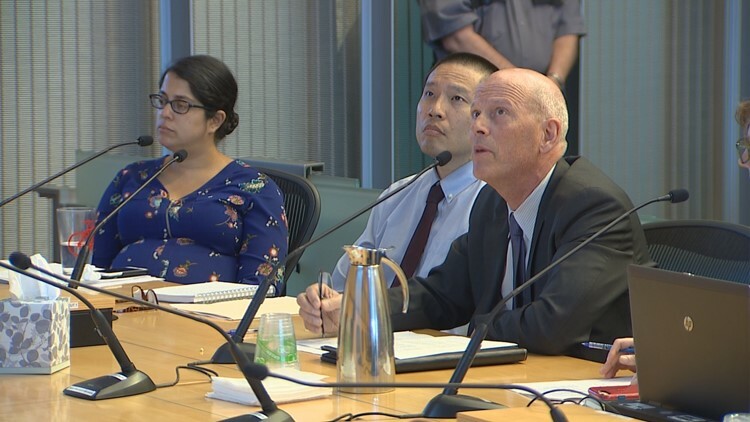 A team from Seattle Department of Transportation, including Interim Director Goran Sparrman, delivered a status report to the Sustainability and Transportation Committee. "What we recognized early on, and should have raised the red flag probably earlier, was seeing that our per mile cost was low and very optimistic in the development of the levy," said Darby Watson, SDOT's Project Development Division Director. Original estimates assumed an $860,000 per mile cost for building bicycle facilities, but now SDOT says the estimate should have been $1.5 - 1.8 million per mile. Rising construction costs and less federal funding than anticipated also contribute to the financial problem. It is raising significant issues for the rapid ride program, the bicycle program, and the sidewalk program. After the meeting, Sparrman said, "a lot of great work has been accomplished that would not have happened without this levy." The report highlights progress including 819 bridge spot repairs, paving over 50 "lane-miles" of busy streets, and safety improvements on school routes. He says a majority of promised projects will happen. "This levy is a giant component of Seattle transportation funding, and it is really critical to creating the kind of city we all want to live in," said Padelford.